I’ve been trying to hold fast to my no-MMOs policy this year, and in general I’ve been doing well with that. The sole exception has been a bit of a dalliance with Star Wars: The Old Republic, though in my defense I will say that this is something I’m doing at my wife’s bidding since she is a huge fan. If I wind up falling back into the sort of persistent MMO trance I used to sink into back in my EQ days, she has only herself to blame. It’s not a typical MMO, though, so it at least has that going for it. It really feels like eight separate single-player games, one for each PC class, where you just happen to see other people running around occasionally, with no need to interact with any of them if you just want to play through your class story. There are, I understand, dungeons and raids to be tackled if you want bigger numbers on your gear… but apart from that, the “MM” part of “MMO” seems to be heavily downplayed. I’m treating this as a bit of an experiment. The game originally launched as a sixty dollar box with a monthly fee and has since become a free-to-play game, albeit one with some hefty restrictions on free players. For example, a completely free player can’t store their items in the regular bank but needs to wait until they are high enough level to afford a dwelling to stick things in, a free player is limited to two hotbars of skills, and a free player can’t toggle their helmet graphics off. They’re also limited to specific, more boring, races and receive 20% less experience than a subscriber. Anyway. My experiment revolves around playing the game as a complete freeloader and seeing how far I can get in the single-player stories without giving EA a dime. To that end, I created a human bounty hunter who I refer to as “Biff Punchnuts” though he of course has a proper and far less offensive name. So far, it’s looking very promising, and I haven’t hit any roadblocks or needed to do any extra grinding. Rather, I’m finding that I tend to be slightly over level for all of the mandatory quests, even though I’m completely ignoring optional ones. But, I want to set any discussion of how the game is as a game aside and talk about the setting, because it’s a setting that has always sort of bugged me. 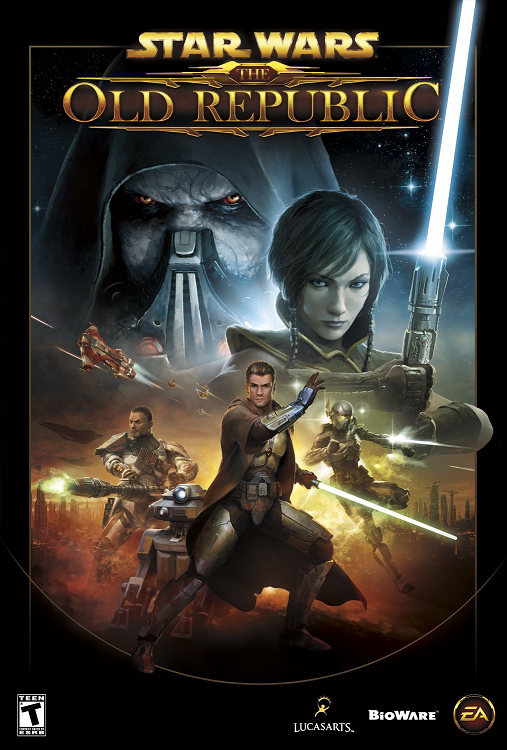 The Old Republic setting started out with a series of comic books, I think, before being turned in to a pair of well-regarded Xbox RPGs and then into this MMO. It’s set over three thousand years before the events of Star Wars: Episode I, so the fact that the technology used in the Old Republic hasn’t really changed that much in those three thousand years doesn’t make a lick of sense. The Old Republic has lightsabers, and blasters that look and sound rather like the ones from the movies, and hyperspace travel is a part of normal life, and the landspeeders on Tatooine 3 millennium ago look awfully similar to one that we see rolling down the Mos Eisley streets as Ben and Luke are looking for a pilot to get them to Alderaan. This makes even less sense when Luke complains that he can’t get much money for his speeder because there are newer models, or when we hear a couple of stormtroopers talking about some new piece of tech. It’s almost as if technology was completely stagnant for centuries, and then some event started the cycle of innovation up after this long period of stagnation. For another example – Y-Wing bombers (the greatest starfighter ever put to film) are considered first-rate ships in the Clone Wars and used to great effect in Rogue One, but barely seen on screen after that and completely phased out by the time of Return of the Jedi. That’s, what, two or three decades before winding up on the scrap heap? We’ve been flying F-15s for nearly 50 years and are just looking to phase them out in 2022. So, what if we assume the event that got technology actually started MOVING again was the fall of the Jedi Order… as if the “thousand generations of peace and justice” Kenobi whines about in his little hut were made possible through the Jedi ruthlessly suppressing any technological advancement that might challenge their position as, well, basically a bunch of extremely self-righteous space wizards manipulating the democratically-elected Galactic Senate from behind the scenes. The parallels to the role of the Catholic Church in the Dark Ages are obvious, and left as an intellectual exercise for the reader. I’m not sure who Anakin is in this analogy. Charlemagne, maybe? Look, my sum total of research on the topic is roughly five minutes on Wikipedia. It is possible, of course, that I am overthinking this. This has been known to happen. Still, I really think they should have set the “Old Republic” stuff a couple hundred years – TOPS – before the events of Episode I. This entry was posted in MMORPG, PC Gaming, videogames. Bookmark the permalink. This has always bugged me about the Old Republic setting, too. It makes absolutely no sense whatsoever, and no-one ever seems to acknowledge it either. I quite liked SWTOR for the brief period I played it while it was a full-price game, but like most MMOs, the further you go the more important it is you engage with the MM side of things, and the cool story-based stuff starts to peter out a bit. I haven’t returned since it went f2p since the f2p restrictions just seem a bit too harsh for my liking. I think I get some benefits for actually owning the original full price game, but to be honest I’m not really in an MMO place any more!